If you’ve been enjoying Glow on Netflix then you’re certainly going to love All Wins by Novomatic. This slot is practically glowing! All the symbols are made from neon lights, just like the logo and all the paylines. This jackpot game from Novomatic has a real 80s vibe to it. Not only because of the design but also because of the simple theme. It’s a very classic-style casino slot machine. It would honestly look right at home in any old-school games arcade. Think leg warmers, sweat bands, leotards, high-top sneakers, perms and neon lights. Oh, and don’t forget fruits – of course! There are lots of vitamins hiding in this game. Fresh fruit is a fantastic source of vitamins! The fruit symbols in All Wins won’t give you vitamins but they will give you payouts! There are 5 paylines that run across these reels and they are the things that pay! Winning symbols glow with a surge of energy before you get the win! There are three different jackpots that you can win in All Wins. The smallest jackpot is the mini jackpot. Then there’s the mini jackpot and the maxi jackpot. All Wins could be compared to some other slots from Novomatic. For a similar vibe, you could try: Spectrum or Star Nova. For something completely different, try one of Novomatic’s most popular slots so you can see what they’re all about. 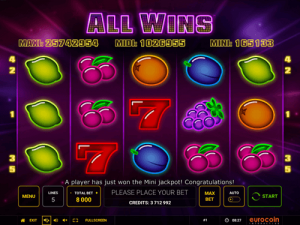 All Wins is a very special and unique slot game from Novomatic casino. It’s perfectly named because all wins count! There are 5 paylines but they don’t work like they do in many other slot games. Any combination of three or more identical symbols on a line will award the payout that’s displayed on the paytable. The paytable will adjust its figures if you change your bet. It shows the payout you’ll get for 3, 4 or 5 of any symbol. All other slot games, players adore: Book of Ra Deluxe, Lucky Lady’s Charm Deluxe, Mermaid’s Pearl and Dolphin’s Pearl Deluxe too, require you to spin as many identical symbols as possible. What makes All Wins different is that the paylines don’t pay any particular way. As long as you get at least three of the same symbol on one of the lines, you’ll get the win! There are 7 symbols in total but only 6 of them give out ordinary wins. These are the fruit symbols made from neon lights! This design is a refreshing change from Novomatic’s usual style. The two highest-paying fruits are the grapes and the watermelon. The watermelon is cut in half, so you can see the whole middle and the seeds. These two symbols pay up to 100x your bet! The lower-paying fruits all give out equal payouts. These are: the plum, the orange, the lemon and the cherries. These other fruits pay up to 25x your bet. There are no Free Games in All Wins. Neither are there any bonus games. This might sound negative but actually it’s great. Why, you ask? Well, it means you don’t have to trigger any special game rounds or bonuses to be able to go for that jackpot. While you’re playing All Wins, you could literally win any of the three jackpots on any spin! You can be playing in manual mode, where you have to spin the reels by pressing the button each time. Alternatively, you can play in automatic mode. Autoplay can be enabled or disabled by pressing the button at the bottom right of the reels, next to the ‘Start’ button’. Autoplay keeps going until you stop it – it’s not a very sophisticated feature. You can’t set it to stop after so many spins or a win of a certain size. However you’re playing the game, you can win the jackpot on any spin. The red seven is the symbol that will get you the jackpot win! If you spin the reels and three red sevens land in view, you’ll get the mini jackpot. If the reels stop spinning and there are four red seven symbols in view, you’ll be paid the midi jackpot amount! Finally, to get the maxi jackpot, you’ll need the reels to stop spinning with five red sevens on show.